The idea I found used frames without glass. That would work too. 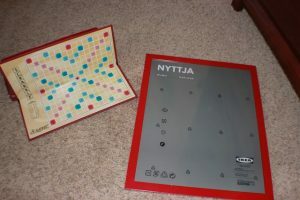 I happened to find these NYTTJA frames at Ikea (Have you figured out that I love that store?) that had plexiglass in the center. I thought they would be perfect. There are several different sizes and many of them fit. Some I bought a bigger size and used wrapping paper as the mat. Others were so close and I actually trimmed the edges of the board games a tiny bit using a pair of tin snips my husband had in the garage. On the back of the frame I used packaging tape to tape a clear sleeve to hold the directions to the game. I had originally tried velcroing a bag to hold all of the pieces. I found that it pushed the frame off the wall too much and a couple of the bags actually fell off. So I opted for disposable plastic food containers which will fit nicely in our new kitchen bench. I just googled images of each game, printed in out and stuck it on the top of the container as a label. What I liked about this idea was that yes it is very functional (we just take the frame off the wall and play directly on it). But it also serves as the perfect artwork for our basement stairs that lead to the playroom.